Corporate – Executive officer, or majority owner of voting stock. Must submit three satisfactory credit references in Texas for firm, as listed on attached application. 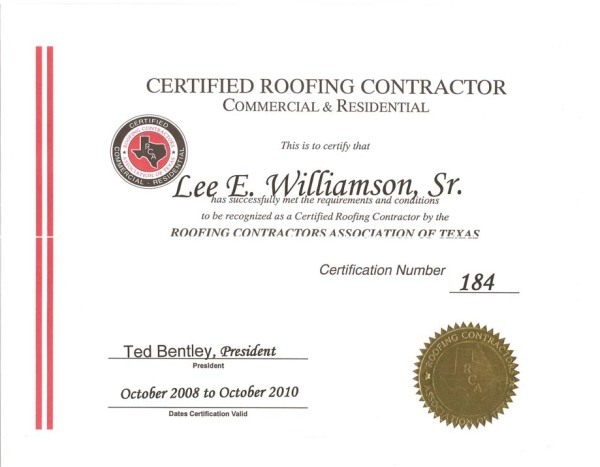 Must submit four satisfactory business references in Texas, one each from a customer, a manufacturer, a supplier, and an RCAT contractor member. For commercial contractor applicants: $500,000 combined single limit general liability and evidence that your firm can obtain a $100,000 surety bond, cash, property bond or irrevocable letter of credit – you may send a copy of a previous bond that meets the amount stated. For residential contractor applicants: $100,000 combined single limit general liability insurance or evidence that your firm can obtain a $10,000 surety bond, cash bond, property bond or irrevocable letter of credit – you may send a copy of a previous bond that meets the amount stated. Worker’s compensation, or other plan providing approximately equivalent benefits and in compliance with Texas laws governing such coverage, acceptable to the Certification Committee. Must pass basic business and safety knowledge exam plus residential and/or commercial roofing exam with a score of 70% or better on each exam. Ready to find out whether you need roof repairs, and if so, what the cost will be? We offer free roofing inspections in the DFW area! To request yours, just fill out the form of this page.